The curanderismo (“healing”) of the Amazon Jungle is one of the most powerful in the world. An incredible variety of medicinal plants exist in the jungle, some known and many more yet to be discovered. There are now many scientific studies of the healing properties of plants in general. Traditionally this kind of investigation was done by curanderos (healers) with the help of various plant teachers. One of the most powerful teachers is Ayahuasca, “the vine of the spirits”; “aya” = spirit and “huasca” = vine in Quechua. Ayahuasca is a brew of two plants which are prepared together. One of them is Ayahuasca (Banisteriopsis caapi); and the other is Yaje or Chacruna (Psychotria viridis). There are other plants that can be used in place of Yaje for a similar effect. In the Amazonian cosmology, all plants and all other elements of nature have their own spirits. With Ayahuasca, it is possible to see and speak with these spirits. Ayahuasca allows travel to other dimensions. One can communicate with the whole spirit world – and more..
Diseases may have organic origins, spiritual origins, both, or even more aspects. 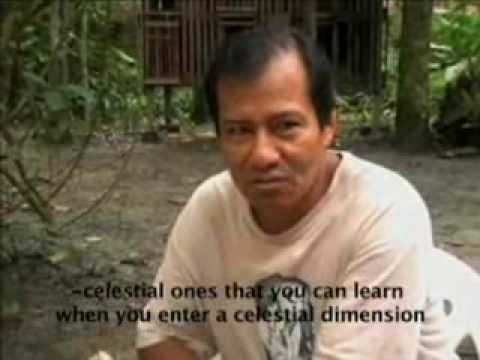 Ayahuasca heals on all levels, as it is connected to all of them. Healing happens through cleansing and restoring imbalances between the body, mind, and spirit. Ayahuasca is a strong purgative (allows profound cleansing through vomiting and diarrhea), an antibiotic (kills microorganisms such as bacteria and viruses), an analgesic (painkiller), disinfectant, and cicatrice (speeds healing of wounds). To use Ayahuasca, one needs to know how to prepare it, how much to drink, where to drink it, with whom to drink, and much more. An Ayahuasca master (maestro) knows how to keep a ceremony balanced between the material and the spiritual and can guide the drinker through a combination of Ayahuasca’s wisdom and his own wealth of experience.